2) We don't need the arm to make a positive I.D of Lovelady's shirt, as I'll show you.
" Next, we get to Doorman's shirt, and bpete quoted several times in the distant past in which I described Doorman's shirt as "plaid." Well, that was a mistake. The most you can say about Doorman's shirt is that in some versions it looks "varied.". Plaid is a very specific thing: it refers to horizontal and vertical lines crossing forming boxes. It is a rectangular pattern. It is geometric. But, even in the most distorted, hazy versions of Doorman, his shirt never looks plaid. It just looks splotchy. What you see above is as "plaid" as Dooman's shirt ever looked, which is to say, not plaid at all. And the splotchyness you see there is mostly haze and distortion. Is there any reason to think that Lovelady's shirt on the right would come through for Altgens as what we see on the left? I'm afraid not. I stood in that doorway wearing a plaid shirt and was photographed exactly as Oswald was- with Tri-X film from the same position and the same conditions. The rectangularity of the plaid came though, even on Tri-X film. Plaid looked plaid! You see horizontal and vertical lines crossing. bpete is mentally obtuse, so let's try some repetition. Now, I hope that bpete never again describes Doorman's shirt as plaid because he has been sufficiently informed. I was mistaken for saying it back in the early days. But, we learn; we grow; we move on. Isn't it true of all of us?" Firstly, it's important to remember that Ralph Cinque's Altgens recreation was never designed to be objective and is seriously flawed on virtually every level. He used the wrong camera, the wrong lens and shot from the wrong position. For some shots the correct film is used, but even this point is largely negated by the fact that Ralph will often try to slip a digital image into his presentations which was shot simultaneously and not mention which is which. 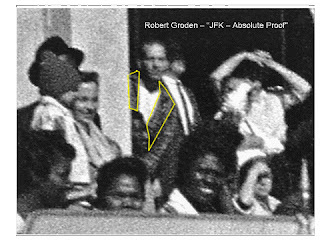 Even though he claims that the focal point of the camera was set fifty feet ahead ( the approximate position of Kennedy's limo in Altgens 6 ), he presents some shots which are clearly focused on the doorway. The plaid shirt chosen to represent Lovelady's features a predominantly white pattern, selected to be as visible as possible at distance. Nobody in the doorway is correctly positioned. I could go on and on about this, but in short Ralph Cinque's "reenactment" is an undocumented, inaccurate, shoddy mess. This is the reason why Ralph is able to present the comparison above, showing a shirt with giant, highly visible white squares which bears no comparison to anything seen on Lovelady's shirt and claim it demonstrates his contention that "plaid looked plaid". What it actually demonstrates very well is that there's nothing that Ralph won't misrepresent or lie about.
" 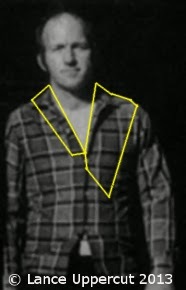 to be plaid, it has to show horizontal and vertical lines crossing forming boxes"
Let's crop Lovelady from the picture and outline the approximate area of shirt visible in Altens 6. Not very much is it? At a rough guess, maybe 25% of the shirt front is visible in Altgens 6. So, in a small area of the shirt we will see lines, but boxes.....well, not so much. There's one possible area - the upper left - where we may see enough to show a complete box, but as we've already demonstrated above using Ralph's own photo, in an unfocused shot at distance plaid does not necessarily look like perfect plaid. So much for Ralph's claims of what we should expect to see. So what are the chances that what Ralph dismisses as "splotchiness" and "haze and distortion" will arrange itself into a match to Lovelady's plaid pattern? Since these are terms which imply randomness and disorder, you'd expect the answer to be pretty much....none. And yet, the reality is somewhat different, and certainly much different to what Ralph would have you believe. Let's look a little closer. First, let's look at a way of getting a visually direct and honest comparison of Lovelady's shirt to Doorman's. 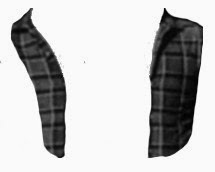 These were then overlaid to a crop of the Doorway figure taken from the Groden Doorway scan. they were rotated and resized to match the image and some further cropping was done to remove unnecessary parts, but no other alterations were made. Due to the different position of Lovelady in the two images ( stood straight in the Jackson photo and leaning sharply to the left in Altgens ), matching the exact lay of the shirt isn't possible, although the right side of the shirt ( left as we look at it ) matches surprisingly well as it is. It would be possible, using some perspective changes and minor tweaks, to make a much better fit of the left collar of the shirt, but I haven't done this here to avoid altering the image beyond the necessary rotation and size adjustments. I've added the fading lines for clarity, but the match is obvious without them as soon as the shirt pieces are placed in position. Notice that we can see perfect matches to both black and white lines. Now lets overlay the shirt in position and match the obvious visible vertical line too. In the second gif above I think a good case can be made for the vertical white line on the right of the shirt too ( left as we look ), but it's less clear than the one on the left ( our right ) so I've left it unmarked. It's also remarkable that the right collar of the shirt is an almost perfect match to Lovelady's when placed in position. What you can clearly see here are real and tangible matches, not imaginary seams and invisible button loops from the O.I.C catalogue of misdirection. It's obvious then that we do see intersecting lines in Doorman's shirt. If any more of it were visible I have no doubt we'd see boxes too, but that really doesn't matter. 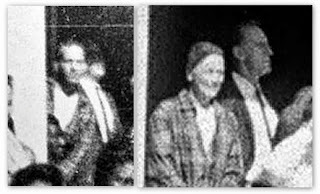 ANY confirmation of a pattern on Doorman's shirt rules him out as Lee Oswald, whose shirt was plain. Is "haze and distortion" going to form an almost perfect match to Lovelady's shirt pattern? No. What we can plainly see is, beyond any doubt, a match to Billy Lovelady's plaid shirt, the shirt he was wearing when he stood in the TSBD doorway and witnessed the assassination of the president on the 22nd of November 1963. 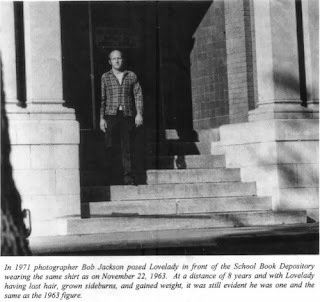 This of course rules out the need to consider any further the possibility that Lovelady was wearing a red and white striped shirt on the day of the assassination. It was just an FBI mix up. Nobody told Billy Lovelady to turn up in the shirt he was wearing on 11/22/63. Simple really. 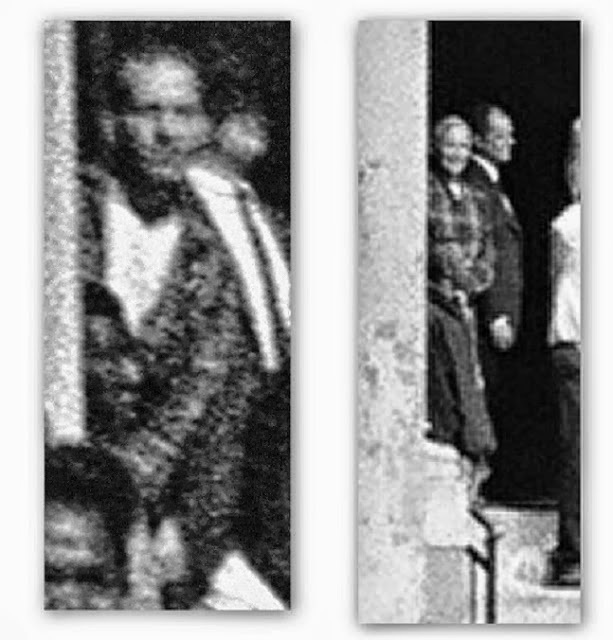 Remember, Oswald does not need to be in the doorway to be innocent of shooting JFK. And we certainly don't need him in the doorway based on the lies and distortions of Ralph Cinque and the O.I.C, whose purpose is to discredit JFK research and researchers, not to advance it. As far as I can see there's only one possible rebuttal available to him - and I'm really hoping he tries to use it! Possibly one of the best deconstructions of this that I've ever seen. Thanks. This whole affair would be a great assignment for the college students' Logic class. Maybe Philosophy, too. You know, the 'Mind-Body problem', e.g. I wonder if Ralph is going to make 150 posts before the end of the month ? Wouldn't surprise me but it's not hard to do when none of them say anything.. Yes, never has so much been written with so little done. The opposite with you, Mr. U !!!! Thanks again. Fascinating that you use the Groden photos for your comparison! You do not seem to know that Judyth Vary Baker has done a comparison of the pixels of the checkered shirt with Doorman's shirt and they are not the same. When you focus in, the separation between rows of checks remain constant, but there is no comparable separation on Doorman's shirt. Why you want to fake something so important is beyond me, but you are provably wrong. I'm aware of JVB's comparison, which is irrelevant, since we are accounting for the CLEARLY VISIBLE pattern on Doorman's shirt. Please demonstrate what I have "faked" in this very simple comparison Jim. If I am PROVABLY wrong then please offer PROOF. So far, no one from the O.I.C. has even come close to doing so. Can you believe Fetzer still clings to Judy's story? This is dementia, no question. Someone must save Jabba Jim Fetzer. Where's the benzedrine, Mrs. Murphy?? How much confirmation do we need?